We all have a difficult person on our Christmas list. Maybe its the teenager who seems to have everything, or the father-in-law who professes not to want "things" but still looks crestfallen when his present is a gift to charity. For inspiration you might want to consult Dave Barry's Gift Guide to End All Gift Guides. Although no longer in print, this book is still available for your consultation at the library. If your giftee has done you wrong this year, maybe consider Can of Pork Beans in Milk Gravy or Glow in the Dark Squid. If your Christmas tradition includes heartwarming tales told round fire, The Stupidest Angel: A Heartwarming Tale of Christmas Terror by Christopher Moore may put a different spin on the season. A child witnesses a Santa dispatched from this world by a shovel and wishes for his resurrection. Luckily an angel just happens to be waiting about to grant just such a boy a wish. Unluckily, this angel is none too bright. He botches this relatively simple task and unleashes a horde of zombies on this unsuspecting town. Chaos, as they say, ensues. If shovel wielding zombies are not your cup of tea, maybe a nice dose of designer labels, selfishness and comeuppance would be more the thing. A Christmas Caroline by Kyle Smith features Caroline, an accessories editor for a fashion magazine, who is given products all year long. She has no time for Christmas when others are receiving presents. In the style of A Christmas Carol, she is visited by the ghosts of those she has wronged. She must mend her ways or face a fate worse than that of a sidewalk Santa. OK, we can't totally ignore the spirit of the holiday season. The Secret Life of Mrs Claus by Carly Alexander is a collection of three stories about women who have their Christmas spirit re-awakened by a shared experience with a Mrs. Claus suit. Nice to see Mrs. Claus get some well-deserved recognition. Holidays are the perfect time for story telling. 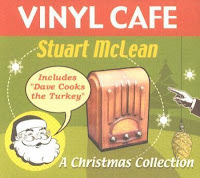 Vinyl Cafe: A Christmas Collection by Stuart McLean is available on cd and is as good an accompaniment as Christmas music. His voice and performance is distinctive and modest. Listening to his stories, you find yourself laughing suddenly and explosively. CBC says,"More fun than Christmas pudding! This new yule-inspired features the ever-popular Dave Cooks The Turkey story. It's all you need to kickstart a few new holiday memories of your own." And, finally, how can we think about Christmas without considering the vampires. Regarding Undead and Unreturnable by MaryJanice Davidson the publisher probably describes it best: Though she's the vampire queen, Betsy Taylor is much more like a princess. In MaryJanice Davidson's novels, this high-maintenance monarch is finally coming to terms with her new status. They say Christmas is a time for friends and family. But with a half-sister who's the devil's daughter, an evil stepmother, a fiend living in her basement, assorted spirits and killers running amok, and a spring wedding to plan with the former bane of her existence, Eric Sinclair, Betsy is not sure she'll survive the holidays. Oh, right. She's already dead..."